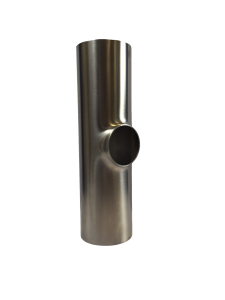 Equal lengths from the centre to end faces, but the pull is reduced length & bore. Many size variations stocked – see below table. Manufactured in house by BSF. Equal reducing tee’s available on request. Metric pulled reducing tees also stocked – see our metric range. Branch is produced “as pulled” therefore there is no standard pull length. Special manifolds to the customers specifications can be produced by BSF. Please note: Not all sizes, grades and configurations necessarily available from stock. Reducing Tee Size: 1" x 1/2" 1" x 3/4" 1.5" x 1/2" 1.5" x 3/4" 1.5" x 1" 2" x 1/2" 2" x 3/4" 2" x 1" 2" x 1.5" 2.5" x 3/4" 2.5" x 1" 2.5" x 1.5" 2.5" x 2" 3" x 3/4" 3" x 1" 3" x 1.5" 3" x 2" 3" x 2.5" 4" x 3/4" 4" x 1" 4" x 1.5" 4" x 2" 4" x 2.5" 4" x 3"